Last updated on 17 July 2017. FAQs relating to our performance exhaust manifold, unichip, Stage 1 Kit and camshafts for the Fiesta ST150 / XR4. Do you sell camshafts for the Ford Focus Mk1 (Duratec 2.0 16v)? Yes we sell the SWR Duratec performance camshaft set. I am interested in a better exhaust manifold for a Ford Fiesta ST150 (2L Duratec). At the moment I am running a standard manifold, no flex, no cat. It is a gravel rally car, fitted with a sequential gearbox. The ECU has a flat shift function, which retards the ignition to unload the gearbox, and this generates a backfire through the exhaust system on every upshift, so the manifold needs to be strong enough to cope with that. The standard manifold has so far been ok. We only had to remove the flex because it would not last. Please let me know if you have something that you can recommend. We have the perfect header for you. It is extremely durable and very strong. We only use a quality spring loaded knuckle instead of a flex. It is much stronger and doesn't disintegrate. The guys here in South Africa use it for rallying. We have Aussie guys purchasing our SWR header and they are all extremely happy. It will give you plenty of torque and power from low down. I bought a 4-2-1 branch off you for my Fiesta XR4. I haven't been able to install it. However, that has changed and it's currently getting ceramic coated (too good a price to knock back! ), and will be going on in the next few weeks. I'll be getting a Piper rear back box to go with it. I'm just wondering if you think a 200 cell cat would be worth it? I know standard is 400 cell, but just wanted your professional advice. Car has 210,000 k's on it, but still runs like a dream! Really looking forward to finally getting your branch on. The guys over here in Oz who have it rave about it. Any thoughts will be greatly appreciated. A 200 cell cat will be fine. We don't need to run cats here in South Africa, so don't have too much experience on that. But we have ST 150 customers in Europe running 200 cell cats and they are happy. Do I need to change my vernier pulley when installing your camshafts? No you don't need to fit vernier pulleys. The standard pulleys are a taper pulley and can be adjusted infinitely just like a vernier pulley. For the fiesta XR4, I want it to crackle and pop on overrun every time I lift my foot off the throttle. I was told that SWR headers, high flow cat and a new less restrictive muffler will do this. In your experience is this true? Yes it will. It sounds great and you will be so impressed with the massive gains in power and torque. We have many customers that are very happy with the sound and performance. Customers here in South Africa replace the rear silencer with a 180mm diameter x 500mm long round free flow silencer. It sounds really cool. If you fit the manifold will you need a cat fooler on the lamda point or does the unichip cancel out the error code? The Unichip takes care of the engine light, so you won't need a cat fooler. I have a Fiesta St with a chip in it at the moment. I would really like to have a turbo put in, what are the costs and processes and is it possible? I stay away from turbos. I have seen too many broken engines and gearboxes. We have the Stage 1 SWR kit which gives you around 20 kW more power and 30 Nm more torque and is very reliable. Or the Stage 2 kit which includes cams and gives 30 kW increase over standard and is very reliable. We have customers that have done more than 200 000km with our SWR kits fitted to their Fiesta ST. I have a Fiesta ST150 Duratec here in Australia and it's running your headers. I will need the Unichip piggyback. Can you talk to me about the power increase I will receive? The car is a rally car - so ideally I need torque as much as power. Will this suit? Our piggy-back ECU is perfectly mapped for our performance hardware and makes a massive difference. It will give you lots of extra torque and power and throttle response. It is extremely responsive and basically has a flat torque curve from 2000rpm to 6000rpm and above. - Can I piggy back a standard ECU? Or does it need to be flashed? It piggy backs off the standard ECU, so no need to flash. - Currently the car has an ECU that is flashed, apparently to 156BHP - what will happen bolting the UNICHIP on, the reason I went to yours is due to using your headers. I’ve been told to be careful of using piggy back computers as they tend to lean the car out when using top gear and staying up towards the rev limiter. Rally, that happens. 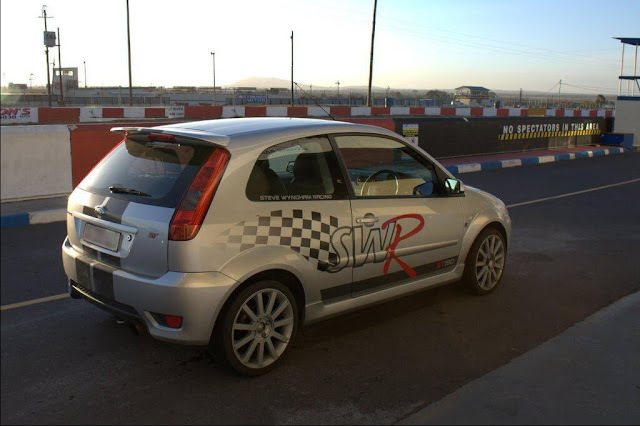 We raced a ST 150 back in the days when they first came out. The standard Siemens ECU is very good. We ran the car in Group N production car form. We were only allowed to Blue Print the motor. I fitted a Haltech stand alone ECU and we could find hardly any more power out of the engine. It's only when you change hardware like headers and cams that remapping makes a difference. I would suggest you flash the standard ECU back to the original Ford map. Then fit our SWR mapped Unichip. Then it works off the original OE map as a base. We have been using unichips for years in racing and rallying and have never had problems. My friend Peter de Weerdt a South African developed the Unichip. We ran them back on our works Fords back in 1996 already. He runs one on his Turbocharged Lambo Gallardo! It works perfectly at high RPM. I have customers who have our ST 190 kit fitted and have done over 200 000km without any problems whatsoever. © Steve Wyndham Racing Blog.